Video-conferencing has become a part of working life for many staff. Although portable systems are available on request, the best experience is achieved when a room has a dedicated video-conferencing facility installed. 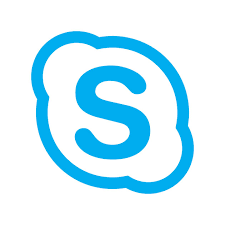 Carrington 203 now has a system installed through which you can connect using Skype for Business on the PC provided. The in-house upgrade has been brought forward and will now take place during the week commencing 5th November, 2018. Our thanks to Room Bookings, Events and Venue Reading for rescheduling sessions that were due to take place in the theatre during that week. 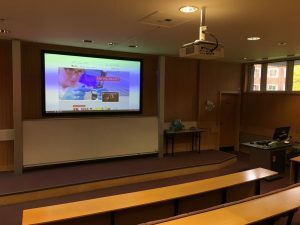 A new projector has been installed as a temporary measure to improve the image. It has not been possible to reprogram the control panel on the lectern so this will need to be controlled via a remote device that has been left in the room. We are checking the room daily and monitoring calls to the Service Desk for any issues. We want to reassure you that we are continuing with our schedule of AV Upgrades across campus. Although we have a prioritised plan, we will respond as quickly as possible where a teaching space becomes unfit for purpose. The TEL & AV Team have updated the AV equipment in the newly refurbished Allen Lab G09. 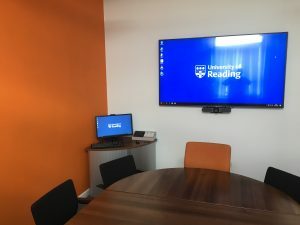 Additional repeater screens, an interactive monitor and microphone have been installed to provide an enhanced teaching experience. The overall room refurbishment was managed by Heather Silk-Jones, Building Support Services Manager in Campus Services and is part of a schedule of works being carried out by E&F to provide more flexible teaching spaces for staff and students. The new layout – seen below – provides an increased capacity of 60 seats. We have received additional funding for the current financial year that has allowed us to accelerate our programme of works. Please see our AV Upgrades page for the latest schedule. We will provide further news as soon as possible regarding our AV Upgrade plans for the next financial year. Note: Anyone can join a Skype Meeting by using the Web App, even if they don’t have Skype for Business. We recommend that users with Skype accounts use this method.